[toc]Varicose veins are enlarged veins which appear mainly on the skin of calves and thighs. They occur due to the malfunctioning of valves inside the veins. Prolonged pressure or obstruction of veins is also the result of varicose veins. Varicose veins may develop due to pregnancy, prolonged standing, long time constipation, particular sitting posture wherein both the legs are crossed or using excessive weights during exercise. These situations put excessive pressure on the veins, obstructing the proper flow of blood and resulting in development of varicose veins. Heredity factor can also result in development of varicose veins. Varicose veins affect women more than men. A deficiency of vitamin C in the diet can also induce varicose veins. Vitamin C and bioflavonoids give strength to collagen structure of veins. As the vein gets weak, the pressure of blood builds up in the veins which result in development of varicose veins. Carrot contains vitamin C and spinach provides necessary fibers. Consume a juice of carrot and spinach. The juice needs to be prepared in the ratio of 3:2 i.e. 300 ml carrot juice and 200 ml spinach juice. Consume this juice on a daily basis. Apple cider vinegar proves effective in curing or reducing the appearance of varicose veins. When applied regularly, it helps the veins in shrinking back to the original size. Apply apple cider vinegar on the areas affected with varicose veins twice every day. Applying early morning and before going to bed proves more effective. Rosemary oil has the property to stimulate blood flow and hence improves blood circulation. Application and gentle massage of rosemary oil on the affected area helps in curing varicose veins. Apply a little amount of rosemary oil on varicose veins and gently massage on the area. Apply twice daily for a better result. Fuller’s earth or multani mitti has very cooling effect. It reduces bloating. Mix half a spoon of fuller’s earth with plain water and form a thin paste. Apply this paste on the varicose veins at night and wash it in the morning with plain water. The bloated veins will get benefited. If the varicose veins have started hurting and are causing discomfort, an immediate relief can be found in hot and cold water rinse. On the affected area, first pour some hot water. Water should be of bearable temperature. It should not burn skin. Then immediately, the area should be poured upon with cold water. For 4-5 times, this procedure should be followed. This helps in improving blood circulation and hence the swelling reduces. 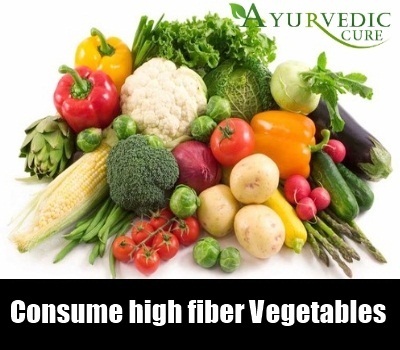 A high fiber diet containing a lot of fruits and vegetables is recommended. High fiber regulates the bowel movement and avoids constipation. Constipation produces pressure in abdomen and hence obstructs the regular flow of blood to legs which in turn results in development of varicose veins. So, consume a high fiber diet and avoid constipation at all cost. Whenever pressure develops in legs, varicose veins develop in people who are prone to it. Avoid keeping your legs idle for a long time. Move your legs whenever you feel the pressure. Apart from this, when you sleep, keep a pillow below your feet. This helps in proper flow of blood and releases pressure from the legs. Also avoid sitting cross legged.